We always buy Nendran Banana Chips at shops. Even though this is a very good snack, we worry because of the oil used. The best alternative is to prepare at home itself. It is a quiet easy only and will be good to try at home. 1. Take 1 tsp of water in a small bowl and add required salt. Mix them well till the salt dissolves in the water completely. Keep it aside. 2. Heat the oil in a frying pan. 3. Cut the head and tail of the banana. 4. Using the knife, slit the skin of the banana at 3-4 places vertically. Now it will be easy to remove the skin of the banana. 6. After few seconds, add the salt water (from 1). Now you will get lot of sound from the pan. Don’t panic. Leave it for few seconds. 7. 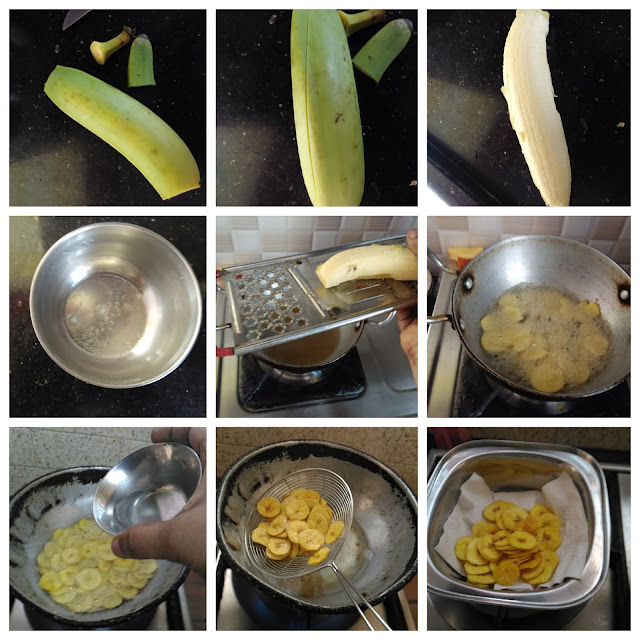 Then using the ladle, turn over the banana slices and cook till the bubbles stops completely. Keep the flame at medium through out the process. 8. Now using the ladle, take the chips and drain the oil. Using the tissue paper, extract the excess oil too. 9. Allow it to cool down completely and then store it in an air tight container. 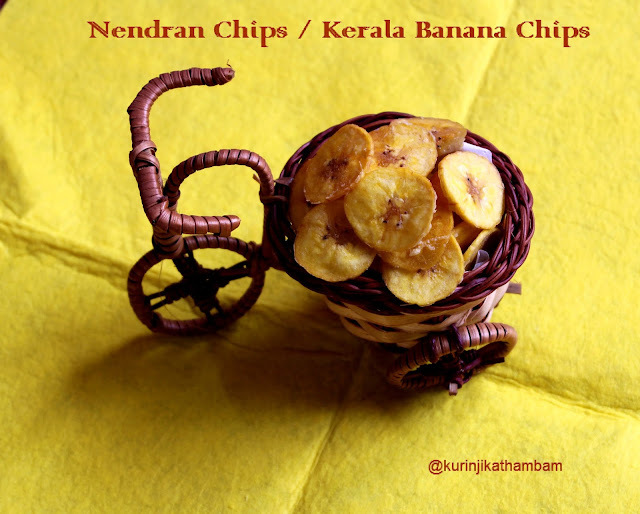 Wow really yummy and crispy homemade Nendran Banana Chips is ready to bite! 1. No need to add turmeric powder because the banana itself has the yellow color. 2. You can also slice a banana into a plate and then put them into the hot oil later. 3. Coconut oil gives very nice aroma to the chips. 4. Don’t overload too many slices into the oil.